I'd like to introduce you to brand new published author Chad Morris. Sorry Chad, I'm out of cookies today. Not to mention I'm trying to quit. Pretend for a moment that your books are your children. Please introduce us. We’d like names, ages, quirks, birth story, any details you would like to share. Alright, well I only have one—an only book. He’s pretty fantastic though. I’m a proud dad. He’s only a week and a half old, and I kind of like to show him to everyone. I actually got the idea while sitting in an auditorium of several thousand people listening to David McCullough, the famous historian. I know—probably not where you’d think ideas for kids fiction would pop up. It surprised me too. I found myself thinking, what would be the absolute coolest way to for kids to learn history? Answer: For them to see it, almost experience it! Have a pirate ship sail through front wall of their class. See armies rushing each other from two sides of the room. Hear from Lincoln himself. And if there were some crazy invention that could let them see history, then what would English class be like? And gym? I felt a world forming. My fiction and non-fiction loving mind was off to the races. Sorry Mr. McCullough, I kind of zoned out there for a little while. Once the world started coming together, I had another idea: What if there was more to one of the inventions than anyone knew? What if the inventor had a secret? When I sat down to write, all different angles of my personality got excited. This was high-concept, fast-paced, fiction fun with references to real non-fiction people and places, and a lot my comedy writing background thrown in. The whole thing snowballed into a story I love. I worked on Cragbridge Hall for a year, trying to pound it out before Shadow Mountain Publishing forgot who I was. I had submitted another manuscript to them and got their attention, though it wasn’t a nice fit for them. Thankfully, this book sealed the deal and a year later it is on the shelves! Oh, and of course, his little brother is on the way—the sequel should hit about March of 2014! A new author and already expecting! Congratulations! And isn't it amazing where inspiration will come from? I'm sure Mr. McCullough would be glad to know he inspired you so well. *winks* Just for fun, please give us the 30 second pitch of your book. Cragbridge Hall is the most prestigious junior high in the world in 2074. Because of some amazing inventions, students see history happen in 3D, study animals by becoming one through robot avatars, and run up virtual mountains in gym. The inventor behind these great contraptions is kidnapped, and it is up to his two grandchildren to follow the clues he left behind, discover the great secret he’s held for years, and save all of reality and history. Yeah, I think it’s kind of awesome. Of course I’m biased, but I wrote the kind of book I wanted to read. Sounds awesome! What a cool, fresh idea. Like one of those where other writers think, "Hey, why didn't I think of that?" as they stare off into space. Like I'm doing right now. I have a full time job, a wife, and five kids. So, writing time is usually down time. I try to sneak it in on the bus ride home from work, and at night when my kids are sleeping. Sometimes I can steal a few hours on the weekend. When I’m desperately trying to hit a deadline, Shelly might take the kids for the whole day, or I might go over to my parents’ basement to pound out as much as I can for a weekend. My desk is definitely messy. And that doesn’t really bother me. It probably should, but it doesn’t. I’m fine to just brush stuff aside to make enough room to plop down the ipad or laptop. I’m way too comfortable in chaos, which of course is rather necessary with five kids. As far as my motivation goes, I just love a good story. I love to create—especially a story I would want to read. There is something about creativity that is motivating. And as far as the mechanics of writing go, I do a very rough outline. I don’t like to plan too much because it feels like homework to me and I like the room to play around as I write. Then I plow ahead, trying to get out as much of the story as I can as quickly as I can. I am the furthest thing from a perfectionist my first time through. I’ll summarize entire scenes if I don’t feel like writing them. Some descriptions are cliché, or extremely thin. In fact, whole sections may be rather intelligible. I just want to know how the story will unfold. I go through a few more times putting in extra layers of meaning and fun. I’ve usually been through it several times before my wife gets to read it. Then I make changes and it’s off to beta-readers. And then one more round of changes and beta-readers before I send it off. Oh, and I go through alternating feelings of thinking my stuff is awesome or an irreparable mess. Sounds like typical writer disease. TWD. Don't worry people. It's not contagious. Favorite stress relievers: Cookie Dough Ice Cream, Basketball, Sherlock, Psych, a good book, throwing my children on giant bean bags, and hanging out with my wife. 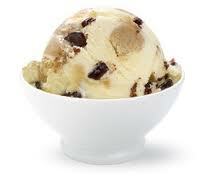 Favorite office supply: Cookie Dough Ice Cream. Oh, wait. Well it should be supplied in every office. Favorite punctuation mark: I love exclamation points! Or is it questions marks? I’m also a comma guy (but parenthesis can be really useful sometimes). Favorite day of the week: I like them all for different reasons, but Saturday probably wins. Favorite movie: Sorry. You get a list on this one. Here are some of my favs: Finding Nemo, Kung Fu Panda, Inception, Life is Beautiful, How to Train Your Dragon, Gods and Generals, Monsters Inc., The Lord of the Rings Trilogy, The BBC’s Sherlock (more of a TV show, but I say it counts. ), Waking Ned Divine, A Pyromaniac’s Love Story, Much Ado About Nothing. Thanks so much for joining me today, Chad! If you'd like to know more about Chad, his book, his awesome wife and family, etc., please visit his blog. And show your kids some love today by getting them their very own copy of The Inventor's Secret. I'm sensing it's going to be the next big thing.